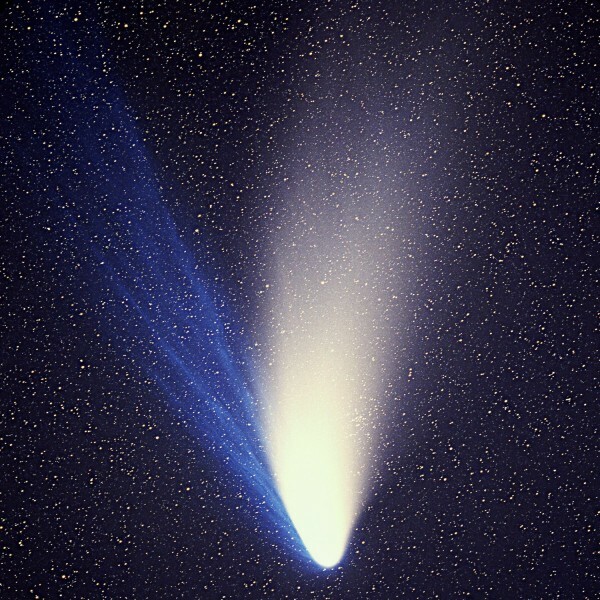 The last widely seen comet for the Northern Hemisphere was Hale-Bopp in 1996-97. Did you see it? Comet Hale-Bopp with its prominent dust (white) and plasma (blue) tails. Photo via E. Kolmhofer, H. Raab; Johannes-Kepler-Observatory, Linz, Austria. April 1, 1997. On this date, Comet Hale-Bopp – probably the best-remembered bright comet for many in the Northern Hemisphere – reached its perihelion or closest point to the sun. It was 0.9 astronomical units (AU, or Earth-sun distances) away from the sun on that day. Its brightness – though dispersed across a wider area than stars – exceeded that of any star in the sky except for Sirius, the sky’s brightest star. As seen from the Northern Hemisphere, Hale-Bopp was the brightest comet since Comet West, sometimes called the Great Comet of 1976. It stayed visible with the unaided eye for a record of 18 months, twice as long as the previous record holder: the Great Comet of 1811. 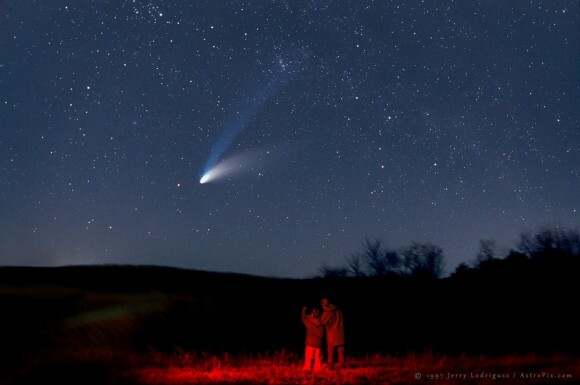 Hale-Bopp – officially labeled C/1995 O1 – became one of the most-viewed comets in human history. There are over 5,000 images of this comet available via a webpage maintained by NASA’s Jet Propulsion Laboratory. Some called Hale-Bopp the Great Comet of 1997 (although others disagreed that it met the criteria for a Great Comet). It attracted so many not only because of its rarity and beauty, but also because it enabled people to jump – in their minds – back in time. Some 4,200 years ago, when Hale-Bopp last passed the Earth and sun, the Egyptian pyramids were newly being polished by sand, and the Epic of Gilgamesh, considered the first great work of Western literature, was not yet written. Comet Hale-Bopp was discovered on July 23, 1995, by two independently observing amateur astronomers: Alan Hale and Thomas Bopp. At that time, the comet was a whopping 7.2 AU from the sun, which made it the most distant comet to ever be discovered by amateurs up until that time. What made that discovery possible was that Hale-Bopp was so bright. It was literally a thousand times brighter than Comet Halley had been at that same distance; Halley, one of the most famous comets, had visited the inner solar system a decade earlier. It was clear that Hale-Bopp was a very special comet, because comets typically don’t shine so brightly when they are beyond Jupiter’s orbit. There were a few reasons explaining the comet’s unusual brightness. The main one is the enormous size of its nucleus, or core. Most cometary nuclei are thought to be no more than about 10 miles (16 km) across. The nucleus of Hale-Bopp had a diameter estimated to be between 25 and 40 miles across (40-60 km). Giant Jupiter is thought to have affected this comet’s orbit. It’s been calculated that Hale-Bopp was last seen in Earth’s skies around 4,200 years ago. Now, though, the comet’s orbit is shorter. Astronomers think that – on what might’ve been its first voyage around the sun thousands of years ago – the comet almost collided with Jupiter. It passed very close to Jupiter again in April 1996, shortening its orbital period still more. The comet’s current orbital period is around 2,530 Earth years. No records have been found of the comet’s passage 4,200 years ago, but that does not mean that no records were made. It most likely means that none survived. Around 2213 B.C., when the comet last was visible, civilizations had been using the sky to track seasonal changes and other phenomena for a long time. They could not have missed Hale-Bopp. For more about the world at Hale-Bopp passage around 2213 B.C., click here. Thus, in a way, Hale-Bopp is like a clock that measures time in millennia. It reminds us of the progress humankind has made since its last visit. Imagine what the world will look like when Comet Hale-Bopp next crosses our skies, sometime around the year 4380. A night under the stars and Comet Hale-Bopp. It remained visible to the unaided eye for 18 months. Photo ©1997 Jerry Lodriguss/www.astropix.com. Used with permission. Bottom line: On April 1, 1997, Comet Hale-Bopp was at perihelion, its closest point to the sun. This comet – remembered by many – was the last widely seen comet from the Northern Hemisphere. Daniela Breitman - a Canadian writer, formerly with From Quarks to Quasars - is currently studying Applied Sciences with the goal of becoming an astrophysicist. 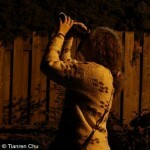 An amateur photographer, she also loves writing and literature and is a huge science fiction fan. In fact, she's passionate about many things.